Last February 18 was a public holiday in Thailand. Yet the day before was Chap Goh Meh, also known as Yuen Xiao, the last day of the Chinese New Year. Yes, CNY is celebrated for 15 days. Anyways, I am not going to explain all the significance and what the Chinese do on each day here but I want to tell you that Hobbit and I had a mini two-some celebration at Wan Chai HK Cafe located at Ekamai Road. My mom would either buy the ready made dough or just make them herself. I remembered the many years I helped her roll the dough and boil them with ginger and rock sugar. Sometimes we even added some red bean paste into the balls so it wouldn't be just plain flour that we were eating. Back to Wan Chai HK Cafe, we were given two vouchers to try out their food there. 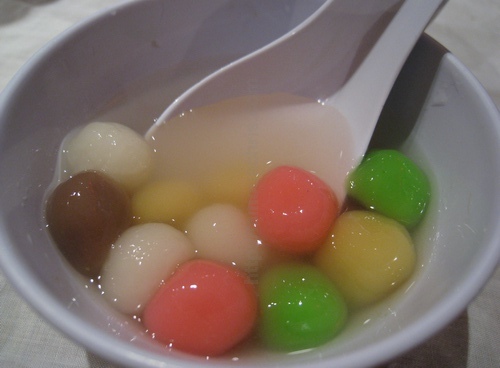 So this was the best time to go since my mom insisted that we eat some tang yuen.